Born in New Jersey , Alan began studying piano at the age of seven, playing both classical and jazz. He attended Indiana University , and received his Bachelors Degree in Jazz Studies from the New England Conservatory. His teachers at the time were Jaki Byard, Thad Jones, George Russell, David Baker and Gunther Schuller. While performing a concert at Carnegie Hall, Alan met the legendary drummer Tony Williams. Pasqua was asked to join The New Tony Williams Lifetime along with guitarist Allan Holdsworth. After recording two ?Lifetime ? 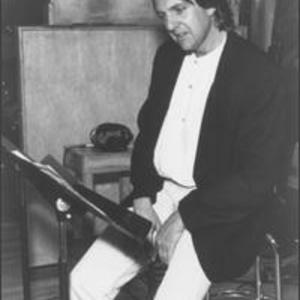 albums for Columbia Records, Alan relocated in Los Angeles . His career in L.A. broadened, as he started playing with more rock and pop artists. First, he joined Eddie Money's band. Then he garnered a coveted spot in Bob Dylan's band, and ultimately joined the band Santana. His other album and touring credits include: Pat Benatar, Ray Charles, Joe Cocker, Ry Cooder, John Fogerty, Aretha Franklin, Sammy Hagar, Al Jarreau, Elton John, Queen Latifa, Graham Nash, Bob Seger, Rick Springfield, Rod Stewart, The Temptations, Joe Walsh, Dionne Warwick and Phil Spector among others. In the late Eighties, Alan teamed up with guitarist Dann Huff to form the rock band Giant. Their debut recording, ?Last of The Runaways?, on A&M Records, contained several songs written by Alan, including the hit single, ?I'll See You In My Dreams.? In addition, Alan has worked with composers, John Williams, Quincy Jones, Dave Grusin, Jerry Goldsmith, Henry Mancini and Maurice Jarre on motion picture soundtracks. He is recognized as the co-composer of the ?CBS Evening News Theme?, which has been airing nightly since 1987. Also, Alan composed the soundtrack for Disney's hit movie, ?The Waterboy?, starring Adam Sandler.